We love learning about the Solar System in our homeschool. We have made an edible version, have a few books on our shelves, watched various videos about space, and have done a couple hands-on activities learning about constellations with a geoboard and paper tube constellation viewer. 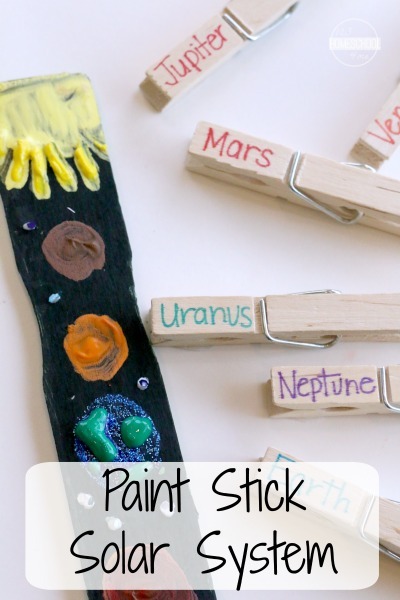 Another clever way to help your child learn about the solar system is with a paint stick! This out-of-this world science and art activity that will aid in learning the names and order of the planets. This Paint Stick Solar System is a perfect hands-on learning activity for your kindergarten, 1st, 2nd, or 3rd grade student. Recently my 8 year old read about Neil Armstrong, so I had outer space on my mind and decided to work on the names of the planets and their order in our solar system. To do so, we made the solar system on a paint stick! Head on over to 123Homeschool4Me to learn how to make and use this Paint Stick Solar System Project!